The problem is simple - then I called friendlies to help me fight mechs they ve just came in and occupied my soldier's spots somehow pushing them away to the crossfire. This allies on the screen standing at my soldier's previos positions. They did more harm than help this way. They shoudn't act like this. I quess it a bug. I’m not totally clear on what exactly is meant by “pushing”. 1 Does it mean that your man is standing in a cell, and an ally comes and forces him to move? 2 Or does it mean that the ally comes and occupies the cell that you wish you could move your man to? First one. 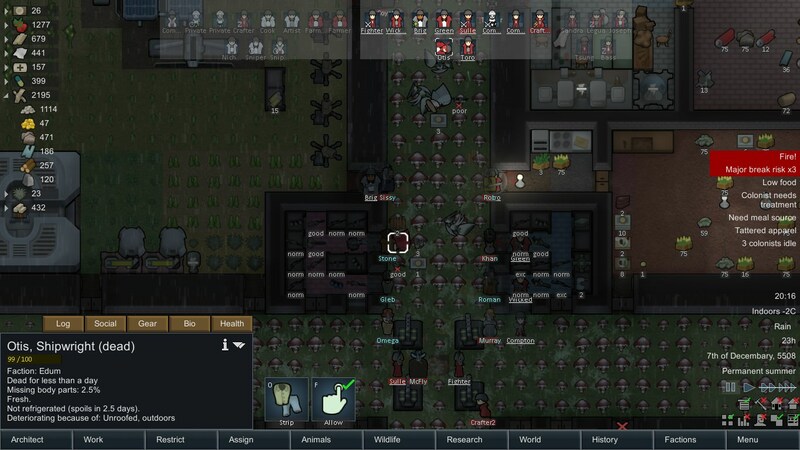 I remember how I placed my pawns at this door's spots, switched to another colony, got a "colonist died messege", and than I switched back I saw that all of my covered pawns moved to the right - 2 at the left side were at my hallway (one of them got a friendly legendary charge lance shot, the most unfair death in my expirience, second one was fighting as usual standing 1 tile righter than a door). Righter colonists got pushed back at my little arsenal, being unable to shoot. Also looks like my melee guys and friendlies standing at the same tile wich is kinda wierd. I don't remember very well but after this another allie occupied busy spot pushing away my soldier then he starts "reloading"
Btw, I m not using any mods, if you ll ask. I conducted several tests using dev mod and found out that it happens every time. Also then it happening your pawn ll get a directive to move back but he ll do nothing even then friendly is gone. But, if player's pawns are not allowed to shot they ll just stand still at the same cell with friendly pawns. This is some odd stuff. Sorry for my possibly bad language and formalization. AI cover mechanic is pre B19, while at B19 or 1.0 it got intruced that pawn allways use 1 tile, and 2 pawn's never can stand at the same tile anymore like previously. The AI cover mechanic need to look for the next "free" cover tile instead for the next free. So what? I m still waiting for some kind of reply like "we will work on it, topic closed"